It’s okay to be selective when it comes to your pets’ living spaces. The New Mexico landscape is unique, and Albuquerque in particular can be dangerous for pets left unsupervised. Natural and urban dangers are unfamiliar for domestic pets who are used to lounging on living room sofas. The ultimate goal of any pet play area is to keep your furry friends safe and comfortable. 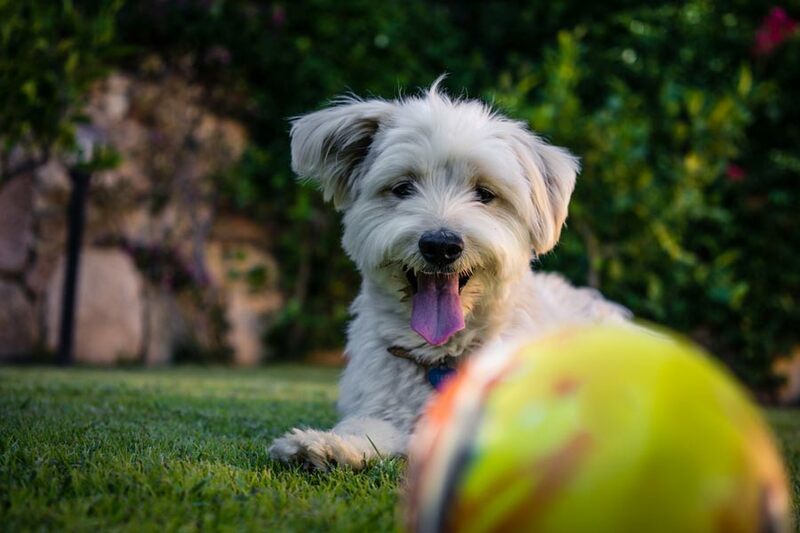 Our artificial grass landscaping experts have put together their top tips to help protect pets in the backyard, so you can enjoy playtime together any time of year. Health is the first key to any pet’s safety. Remember to keep water available for your dog or cat at all times when they play outdoors. This is important during all seasons, even if seems to be relatively cool outside. Make sure shade is plentiful as well to avoid overheating or sunburn on your pet’s nose and ears. Reinforce all fencing that encircles your pet’s play area. This can be done with a solid concrete footer or an L-footer. L-footers use wire placed down into the ground at a 90-degree angle to prevent escape attempts. Consider strategically-placed landscaping as well to discourage pets from jumping over your fence. A border of hedges will help establish a boundary and deter pets from getting too close to the edge of the yard. Make sure your pet’s ID tag is up-to-date at all times. Programs like Home Again Pet ID & Recovery Service work with your dog’s microchip. If the boundary around your pet area fails, you can rely on services like this to quickly locate your pet and get them home safely. Supervise your dog in the yard at all times. Avoid leaving your pet unattended outdoors, even if it’s just for a few minutes. Dogs who escape the yard are often dogs who got bored or became distracted by something outside the property line. Give your dog a reason to stay in the yard by sticking around to play. You will get quality time with your pet – and they will be safer for it, too! Don’t compromise when it comes to the safety of your family pet. Our conveniently located Albuquerque storefront offers pet grass for backyards and public areas of all sizes. Artificial grass if often the foundation for a safe play area that helps your pet enjoy their time outdoors in a safe, controlled environment. Contact us today for a free consultation to learn more and begin your own pet-friendly landscaping project!